Freely Educated: New Year's Eve. It has been a year filled with sadness and great joys. 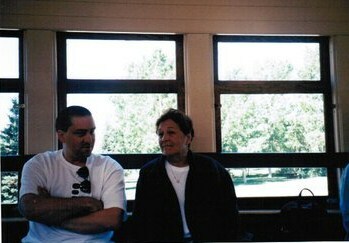 Early sadness was the news that one of my brothers had died, he'd committed suicide. And even though we were estranged, I miss him. Be at peace, Peter. Such sadness led to an unexpected inheritance, and a decision to make this a year of joy and fun. At the beginning of 2012, there was snow and play with the gift from the Winter King (sled). Rye's 5th birthday; that seemed incredible; that he'll be 6 years old tomorrow, is even more incredible. 6 glorious years with my fantastic son. 2012 has seen Rye taking great strides and really growing into himself and gaining confidence and cheek in equal measure. 2012 was the year we had a heatwave in March, and early fun at the beach. The first Folkestone and Coastal Home Ed Camp at Kingsdown, in mid May; the weather was... changeable; nonetheless we had a terrific time. The inheritance opened up many avenues for Rye and myself; a new car has led to many adventures. A year when Rye's play evolved and he became more creative and inventive. The GP Camp at the end of May/early June. An almost washed out camp; thankfully the sun appeared and chased away the rain and cold. Rye made many friends, whom he still talks about. We hope to see many of them again in 2013. 2012 is the year Rye began to show just how much he had been learning through autonomous learning and has continued to surprise me with his understanding. He is a child who seems to understand complexities with ease; but the simples flummox him. He has a gift for making the complex simple. He is a child that needs to absorb learning. A child who the night before simply couldn't remember that plus means "add on", a child who I had stamping up and down the stairs shouting out "Plus means add on", a child who I showed again and again how to do plus sums; and yet it seemed beyond him. 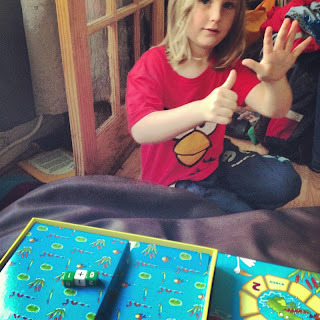 The very next day I came down stairs and found him playing the game on his own, adding up easily. He'd just need to assimilate it in his own time. The mama wobble was over just as it was beginning. 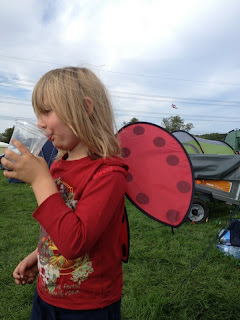 2012 has been a year for camping; thought not an especially great year weather-wise. Lots of traveling and making new friends. A year of being amazed at the breadth and diversity in the home ed community. More new experiences and new friends; not just for Rye, but for myself too. Camping at festivals with friends; and even more new experiences and fun. Gosh, yes a year for immense growth; of coming to grips with fears. Who'd have thought the little boy who use to try to climb up me in hysterical fear of dogs or any large animal; would in 2012 learn to horse ride, and enjoy horse riding! 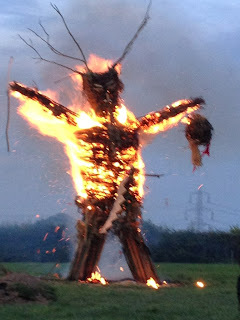 The same boy who last year at the Mercian was afraid and nervous, and kept telling me "I don't like it", as the wicker man burned; and this year was excited to see the wicker man burn; loved watching the morris dancers, watched the rituals without freaking. And keeps asking when we will see the wicker man burn again. 2012 is the year of accomplishment; horse riding, writing, sums, joining groups, leading, mediating, swimming and going to the theatre! Rye has some sensory quirks and found the theatre a very scary place to be; this year he's seen Peter Pan on Ice, the Museum of Science Show and recently the panto, Sleeping Beauty - and he's enjoyed them and been excited to see more. 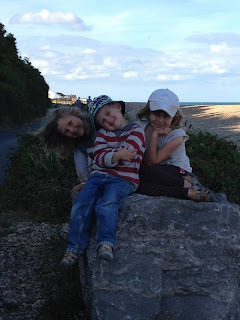 Even more camping and cementing friendships - another local home ed camp at Kingsdown, September time; the weather was much more pleasant! Rye has had a love hate relationship with water; yet in 6 short lessons, with this wonderful swim instructor, my beautiful boy is now swimming and absolute loves being in the pool. The boy who up to the age of about 3 years old was absolutely terrified of the sea and swimming pool. This is the child I was told would never join in groups, would be unable to follow direction because anxiety would cripple him; a child whom I would find increasingly difficult to parent. No, he is the child who has grown beyond measure; a child who happily, joyously attended/s gymnastics, forest school, horse riding, street dance, swimming lessons; who follows instructions, who attends some of these groups without me. He is the child who is learning to read, who asks to write, "like you do mummy." A child whose imagination is vivid and wild. A child who is exuberant, cheeky, funny. He is not difficult to parent, he is really a very easy child to parent; even now as he comes more into himself and is exerting his choices and needs more. He is a child who talks incessantly, whose mind is quick and quirky; yes sometimes it is difficult to follow the associations he makes, which leads him off at a tangent in a conversation; I love his quirkiness, I am excited to discover more of this boy, to see where he goes in 2013, how he develops, what captures his interest. 2012 has been a full year for me too. New friends, new experiences, therapy, exploring, feeling, and finally acceptance and moving on. 2013 does begin with some uncertainty; I need a new minding contract, and I've started a new hobby business; Hooky Delights. Purely for fun, and to fund my yarn addiction - as the inheritance is now gone ;-) The universe will take care of me; an ex-minded child returns part time in January, which gives a little breathing space financially, soon I know a new child will start, and I'll have fun getting to know a new little one and folding them into my little family. For now though I am focused on tomorrow; the day when my son turns 6 years old. Six. Goodness, how time flows.